Mar­itime secu­ri­ty in the Caribbean region has been bol­stered with the deliv­ery of six high speed alu­mini­um patrol craft for the Trinidad and Toba­go Coast Guard (TTCG). Capa­ble of speeds greater than 40 knots and armed with gen­er­al pur­pose machine guns and a 20mm can­non, the 30 metre ves­sels — designed and built by Aus­tralian ship­builder Austal — will expand the TTCG’s sur­veil­lance and enforce­ment capa­bil­i­ty in the region. The on-sched­ule, on-bud­get deliv­ery of the fleet was achieved less than two years from the ini­tial order, with the final ves­sels arriv­ing in Trinidad and Toba­go via heavy lift ship on Jan­u­ary 18. Direc­tor of Trinidad’s Defence Trans­for­ma­tion and Inte­gra­tion Sec­re­tari­at, CDRE Gar­net Best, said the ves­sels would be used to cre­ate a secu­ri­ty blan­ket around the waters of Trinidad and Toba­go. “We are con­fi­dent that the speed of the ves­sels will con­tribute to their effec­tive­ness in the inter­dic­tion of ille­gal drugs,” CDRE Best said. As well as supe­ri­or manoeu­vra­bil­i­ty and speed, the patrol boats ben­e­fit from the reduced struc­tur­al weight, improved fuel econ­o­my and enhanced cor­ro­sion resis­tance that typ­i­fies Austal’s alu­mini­um plat­forms. Austal is now set to deliv­er a five-year com­pre­hen­sive main­te­nance and sup­port ser­vices pro­gram for the ves­sels as part of an addi­tion­al con­tract. Includ­ed in this will be sched­uled planned and pre­ven­ta­tive main­te­nance sup­port, unsched­uled main­te­nance, man­age­ment and per­for­mance of annu­al sur­veys and main­te­nance peri­ods, as well as shore based engi­neer­ing sup­port. Austal Direc­tor – Sales and Aus­tralian Oper­a­tions, Andrew Bel­lamy, said the six-ves­sel fleet rein­forced not only Austal’s unique brand of high per­for­mance defence plat­forms but also the impor­tance of cus­tomised ves­sel sup­port pack­ages. “These state-or-the-art patrol plat­forms will play an inte­gral role in mod­ernising Caribbean mar­itime secu­ri­ty,” Mr Bel­lamy said. The ves­sels are named “TTS Scar­let Ibis”, “TTS Hibis­cus”, “TTS Hum­ming Bird”, “TTS Cha­co­nia”, “TTS Poui” and “TTS Teak”. A com­pre­hen­sive crew train­ing pro­gram, facil­i­tat­ed by Austal at its West­ern Aus­tralian facil­i­ty, was also under­tak­en dur­ing the con­struc­tion process by more than 90 TTCG per­son­nel. Austal is cur­rent­ly deliv­er­ing fur­ther train­ing on-site in Trinidad. 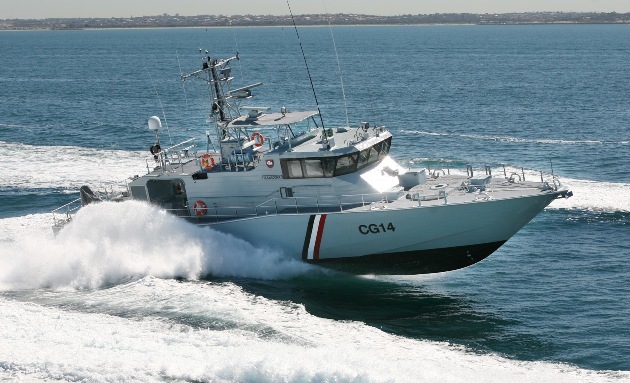 The Austal 30 metre fast patrol plat­form mix­es high speed with high endurance and is designed for supe­ri­or sea keep­ing and oper­a­tion in up to Sea State 6 con­di­tions. Their light but strong hard chine, deep “V” mono­hull deliv­ers manoeu­vra­bil­i­ty, dura­bil­i­ty, speed and a draft of only 1.5 metres. Propul­sion con­sists of two Kame­wa 56A3 water­jets fea­tur­ing advanced mixed flow pump geom­e­try, deliv­er­ing high­er speeds, low­er fuel con­sump­tion, and the capa­bil­i­ty to oper­ate in shal­low debris-laden water. Advanced elec­tron­ic con­trols enable the Cap­tain to manoeu­vre the ves­sel with a high lev­el of pre­ci­sion at high and low speeds. 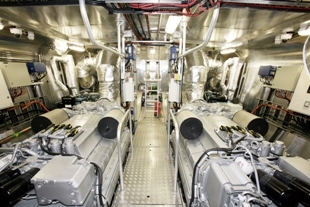 Pow­er­ing these are two MTU 16V 2000 M92 diesel engines, designed specif­i­cal­ly for patrol craft with low load fac­tors that require a high per­for­mance rat­ing. Each engine pro­duces 1630kW at 2450rpm. The propul­sion unit com­bines with the light­weight alu­mini­um hull to deliv­er a max­i­mum speed of more than 40 knots, a range of 1000nm (at 10 knots) and a small tac­ti­cal diam­e­ter and short crash stop dis­tance. As well as pro­vid­ing supe­ri­or vis­i­bil­i­ty, the vessel’s fly bridge fea­tures a con­trol sta­tion, equip­ment mon­i­tor­ing, two gen­er­al-pur­pose lock­ers, a sig­nal light and access to the vessel’s PA sys­tem and main bridge inter­com. Locat­ed both port and star­board of the fly bridge are the vessel’s sec­ondary weapons — .50 cal fixed mount gen­er­al pur­pose machine guns — with a third locat­ed on a remov­able mount at the vessel’s stern. The pri­ma­ry weapon is a 20mm can­non mount­ed on the fore­deck and sup­port­ed by a ded­i­cat­ed mag­a­zine lock­er sit­u­at­ed under­neath. Rein­forc­ing its sur­veil­lance capa­bil­i­ty, the vessel’s main bridge fea­tures a Northrop Grum­man Inte­grat­ed Bridge Sys­tem (IBS) util­is­ing new-gen­er­a­tion Sper­ry Marine Vision­mas­ter FTTM nav­i­ga­tion tech­nol­o­gy, includ­ing an “X” Band radar sys­tem with high speed scan­ner. Inte­grat­ed mul­ti-func­tion con­soles enhance sit­u­a­tion­al aware­ness for the bridge watch team. A HF, V/UHF mil­i­tary com­mu­ni­ca­tions pack­age from CEA Tech­nolo­gies includ­ed crew famil­iari­sa­tion. A Captain’s Cab­in and a two-berth Officer’s Cab­in, com­plete with cli­mate con­trol, are sit­u­at­ed on the main deck, along with bath­room and lock­er facil­i­ties. 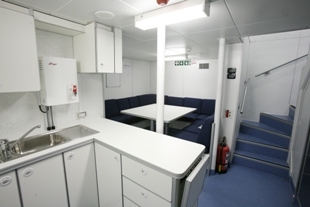 Locat­ed on the out­side aft sec­tion of the main deck is space for the vessel’s 4.8 metre Rigid Inflat­able Boat (RHIB). Launch and recov­ery of the RHIB is achieved via a hydraulic knuck­le boom crane. Ensur­ing max­i­mum crew hab­it­abil­i­ty dur­ing long term sur­veil­lance mis­sions is a spa­cious crew mess, ful­ly equipped gal­ley and laun­dry facil­i­ties, all sit­u­at­ed on the low­er deck along with four two-berth cab­ins. 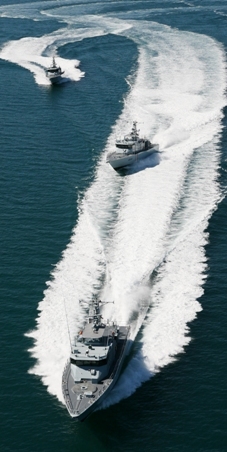 The ves­sels are classed by Det Norske Ver­i­tas — the same clas­si­fi­ca­tion soci­ety used for four 21.5 metre Austal patrol boats built for the Armed Forces of Mal­ta and two large vehi­cle-pas­sen­ger cata­ma­rans cur­rent­ly under con­struc­tion at Austal’s West­ern Aus­tralian ship­yard.